Alternative experience now available on Galactica – TowersStreet - Your premier Alton Towers guide! Time for us to own up… This article was our April Fool’s joke for 2016! Hopefully you didn’t ask a Galactica host to program in ‘Operation Canyon’ today! If you find yourself heading to Alton Towers over the weekend, then the resort have a treat in store for you. 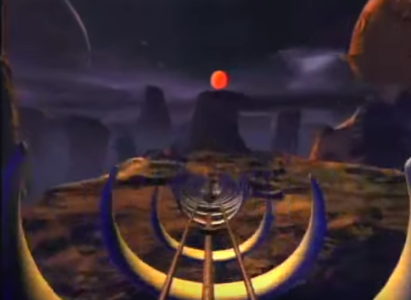 Alton Towers have quietly activated a new alternative mode on their new virtual reality rollercoaster, Galactia. Whilst the ride’s original ‘space tour’ video will be activated on the ride’s Samsung headsets by default, a new “secret” option will now be available, which will be extremely familiar to fans of the simulator rides of the last couple of decades. 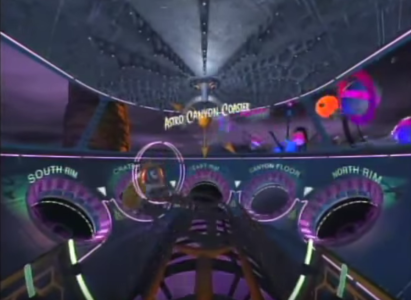 Figment Productions, the producers of the virtual reality technology used on the Galactia, have been busy working behind the scenes to ready a revamped version of the classic simulator “Astro Canyon Coaster”. With all new remastered sound and graphics, the track route of Astro Canyon has been painstakingly recreated to synchronise with the movements of the B&M flying coaster as it takes riders around the course of the ride. Like Galactica, Astro Canyon Coaster takes place in outer space, and riders race around the canyons of an alien planet on a futuristic ride car. The movie has been a classic within simulator attractions for decades, and the original version can still be experienced on small simulators in arcades, right up to larger simulators found in fairgrounds and amusement parks around the world. As the season progresses, Alton Towers plan to introduce further revamped retro options such as Rally Spectacular (rally driving experience) and Ice Kings (a virtual ride on a bobsled track), ensuring guests can experience a multitude of different experiences. The new modes must be activated by the host when you board the ride and are having the VR headset fitted. Much like a secret menu at a coffee shop or fast food restaurant, you’ll need to ask your host for “Operation Canyon”. The host will then programme your headset to display the alternative movie for your ride. Will you be choosing the Astro Canyon or Galactica’s original experience? If you’ve been on the ride since the changes, let us know what you thought over on our Forums.